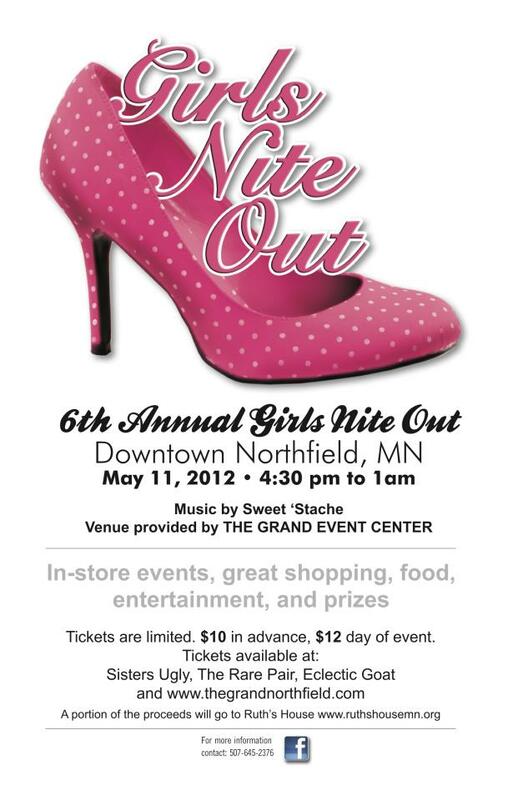 Girls Nite Out kicks off a really big weekend in downtown Northfield. It’s the 6th Annual, from 4:30 p.m. ’til 1:00 a.m., with shopping specials at participating businesses from 4:30 to 9:00 p.m., appetizers, dancing, and prizes at The Grand from 9:00 p.m. to 12:00 a.m., and specials at participating restaurants and bars from 12:00 to 1:00 a.m. So come on down(town) for Girls Nite Out. Friday, May 11th: Girls Nite Out, 4:30 p.m. to 1:00 a.m., downtown Northfield, New Moon Trio, 5:00 to 7:00 p.m., Contented Cow; 2nd Annual Latino Play Festival, 6:00 p.m., Northfield High School Auditorium; Sasha Mercedes, 8:00 to 11:30 p.m., Tavern Lounge; Fred the Bear, 8:00 to 10:30 p.m., Contented Cow; Ova Yonder, 10:00 p.m. to 1:00 a.m., Upstairs Rueb; and Whiskey Trick, 9:30 p.m., Froggy Bottoms. Saturday, May 12th: Northfield Arts Guild Spring Dance Concert, 3:00 p.m., Northfield High School; Jim Lenway, 5:00 to 7:00 p.m., Contented Cow; 2nd Annual Latin Play Festival, 6:00 p.m., Northfield High School Auditorium; Keeley Susienka & Georgia Greene, 6:00 to 8:00 p.m., Hogan Brothers Acoustic Cafe; Andrea Een, 7:30 p.m., First United Church of Christ; Jon Larson, 8:00 to 10:30 p.m., Contented Cow; Jon Manners, 8:00 to 11:30 p.m., Tavern Lounge; Willie Murphy, 8:30 p.m., Grand Event Center; D. J. Music, 9:00 p.m., Rueb’N’Stein; and Chad & Russell, 9:30 p.m., Froggy Bottoms. Sunday, May 13th: Politics and a Pint, 6:00 to 8:00 p.m., and Quiz Night, 8:00 to 10:00 p.m., both at The Cow.